Dr Pepper is prescribing some sugar this summer in honor of its 125th anniversary, the latest in a series of moves by soda makers to temporarily swap out high fructose corn syrup. The spicy soda made by Dr Pepper Snapple Group Inc. is rolling out Dr Pepper "Made With Real Sugar" this weekend through early September. Cans and bottles will feature old logos in the company's deep red, and colorful designs with lions and bright swirls of color harkening back to the 60s. Popular phrases such as "I'm a Pepper" also appear. There are six different can designs. The company wanted to bring back the sugar version to help highlight its past, which dates to the creation of Dr Pepper by pharmacist Charles Alderton in Waco, Texas, in 1885. 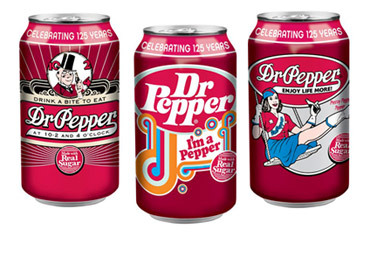 Dr Pepper declined to say if it will try out sugar in other brands such as Canada Dry, 7-Up and A&W Root Beer. Manufacturers are testing sugar drinks as people's appetite for them increases, as some become concerned about high fructose corn syrup. Though they're nutritionally almost identical and equally caloric, some consumers believe corn syrup is less healthy than sugar. Is High-Fructose Corn Syrup Really So Bad? They're also racing to come up with natural, no-calorie sweeteners and reformulate their beverages, though they haven't been able to apply that to major soft drink brands yet. Last summer, rival PepsiCo Inc. launched real sugar versions of Pepsi and Mountain Dew, calling them "Throwback" and using old packaging designs. Pepsi Throwback was so popular the company brought it back for a brief time in the winter. It declined to say what the drink's prospects are for the future. Coca-Cola Co. offers a kosher version of Coke that uses sugar (look for bottles with yellow caps), often available around Passover. Mexican-made Coca-Cola, which also uses real sugar, can sometimes be found in the U.S., and fans pay a higher price for it. One Dr Pepper bottler, Dublin Dr Pepper, has been making the soft drink with sugar since 1891, in the drink's home state of Texas. More could be coming. PepsiCo's Sierra Mist line will now be reformulating into a sugar-sweetened version called "Sierra Mist Natural," according to a report Thursday by trade publication Beverage Digest. PepsiCo, based in Purchase, N.Y., did not return messages seeking comment. The industry switched to high fructose corn syrup in the 1970s as a cheaper alternative to sugar, said Gerry Khermouch, editor of Beverage Business Insights. There seems to be growing demand for it, as evidenced by Pepsi's success with Throwback, even the second time around, he said. But drink makers are also wary of sending a message that there's anything wrong with high fructose corn syrup. "In some ways their worst nightmare is that this thing sells through the roof, because then that's telling them something about how consumers feel about their product," he said.